The first time Derrick Adams saw Patrick Kelly, it was while casually flipping through his sister’s fashion magazines. As a teenager in Baltimore, Adams was used to the menswear stylings of his father and older brother—both sharp dressers in their own rights. 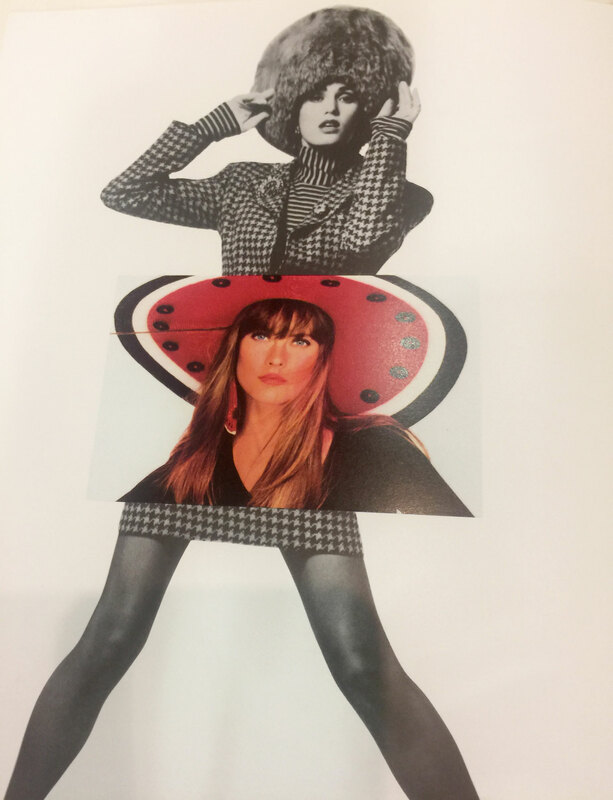 But the sight of a brightly dressed Kelly in the pages of a highbrow womenswear magazine such as Elle was a visual awakening that left an indelible mark on Adams. “I saw this really young, black guy in this fashion spread with all the other black models,” Adams says. “It was striking because he was a young black guy in a major publication. He was at the center image in the photo and he looked very youthful and happy. It was a very unique representation of a black male from what I was exposed to at that time. At that time he was probably in his twenties and I was in my early teens, and it stuck with me. It was a memory of empowerment, seeing that image.” Kelly—with his brightly colored and ornately embellished designs, featured on statuesque black models—was a departure from the fashion industry’s norms in the late 1980s. Born in Vicksburg, Mississippi, in 1954, Kelly was raised by his grandmother, whose inventive style and love of fashion magazines helped shape what would become his signature aesthetic. Kelly studied art at Jackson State University in his native Mississippi before moving to New York and attending Parsons School of Design. Like most New York creatives, he hustled to make ends meet and fund his artistic impulses. On the advice of his friend and model Pat Cleveland—and aided by a one-way ticket that was anonymously gifted to him—Kelly moved to Paris in 1979. Though he struggled there as well—creating costumes for the nightclub Le Palais, taking odd jobs, hosting fried chicken dinners—he eventually found his creative and financial footing. With the help of Pierre Bergé, then CEO of Yves Saint Laurent, he was able to establish his own fashion house in 1985. Despite his migrations, Kelly stayed true to his Southern roots. In his visual language, he often referenced golliwogs, Aunt Jemimas, pickaninnies—negative stereotypical depictions of African Americans that he repurposed for his art. He became famous for his flamboyant designs, especially his bodycon dresses that were embellished with scores of buttons. This design quirk evolved from the styles of Kelly’s grandmother, who used to sew on extra buttons to hide holes in well-worn garments. In addition to the excitement and playfulness that Kelly brought to the runway, he also brought diversity, filling his fashion shows with black models such as Grace Jones, Iman, Naomi Campbell, and his old friend Pat Cleveland. Kelly’s life was cut short at the age of thirty-six by AIDS-related complications. Yet in his brief high-fashion career, Kelly created a brightly colored legacy as the first African-American designer to be welcomed into France’s elite fashion council, the Chambre Syndicale du Prêt-à-Porter des Couturiers et des Créateurs de Mode. Today, Kelly’s influence has come full circle. The visual assertion of those flashy fashion spreads has, in its own way, inspired the work of Derrick Adams, who now seeks to create modern images of empowerment with his art. “When I’m looking for content for my work, I’m looking for stories that aren’t necessarily highlighted in black and American culture, but ones that represent black achievement and success,” says Adams. The multidisciplinary artist—his work spans performance, video, painting, and sculpture—got his start as an undergrad at the Pratt Institute, where he obtained a BFA, and then Columbia University, where he received his MFA. Recent series by Adams, namely “Live and In Color” and “Culture Club,” seek to reshape the way that black people are perceived in media and in pastoral leisure, respectively. He addresses tranquil and ordinary moments in American life, which are often left out of the dialogue surrounding the black experience in America. Adams is creating the visual representation of black identity that he’d like to see in art and the world at large. When presented with the opportunity to collaborate with the Schomburg Center for Research in Black Culture’s extensive archive as part of the Studio Museum’s inHarlem program, he knew rather decisively that he wanted engage with the prized collection that had been donated by Kelly’s estate. Over the course of a year, Adams researched, explored, and pored over press clippings, video footage, intimate photos, and creative miscellany that filled the eight boxes of the official archive. While Adams acknowledges his limited formal knowledge of fashion design, he sees in Kelly a kindred spirit. Their common visual language found Adams merging Kelly’s sketches with his own creative process, an exercise that came rather easily. Once the inspiration of unfinished forms and freehand sketches struck, he started to collect the vintage sewing patterns that Kelly created for Vogue Patterns. In conversation at the Schomburg Center shortly after the exhibition’s opening, Adams broke down his approach. “I started looking at everything very abstractly,” he shared. 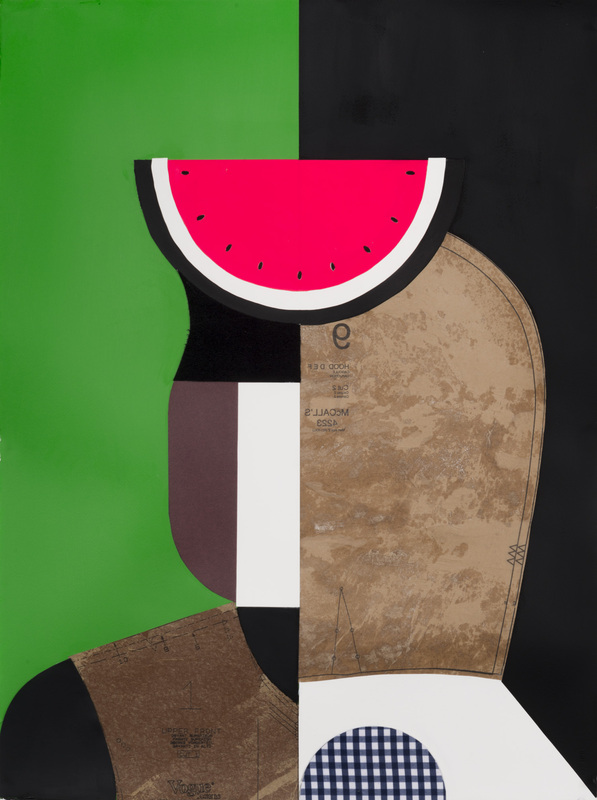 “I wanted to use a basic grid format and geometric structures.” He fused the structural shapes of the patterns into the collages as a way of having a collaborative conversation with Kelly. The resulting series, “Mood Board,” serves as a visual mashup. On canvas, Adams creates landscapes of saturated primary colors interspersed with flashy printed fabrics and cutout panels of unfinished garments. 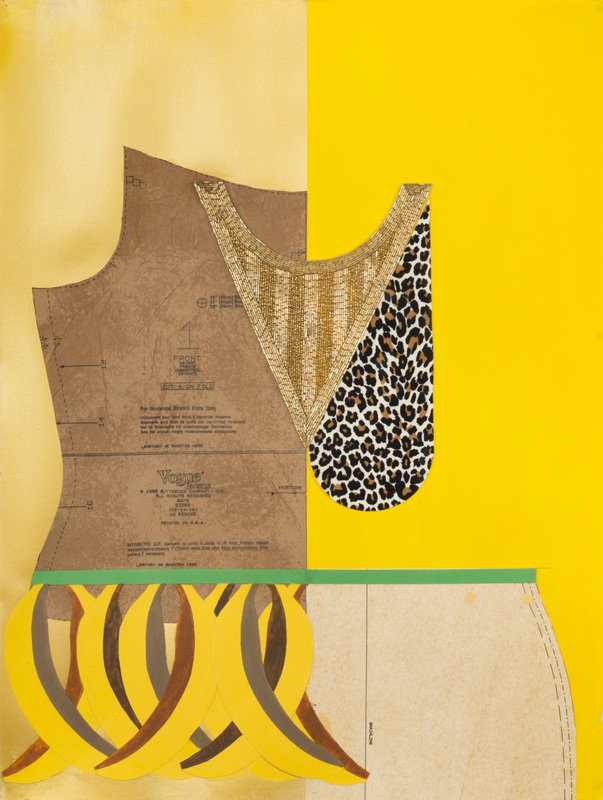 The works in the exhibition revive Kelly’s signature motifs: Watermelon slices reappear as hats in Sunday’s Best, buttons are present as a maze of dots in Work Hard, Play Hard and his show-stopping, banana-skirted homage to Josephine Baker twirls again in Queen of Everything. Kelly himself is recaptured—oversized overalls, flowing black mane and all—in Patrick’s Signature Look, Adams’s deconstructed portrait of the late designer. While “Mood Board” connects Adam’s artistry with Kelly’s in a literal, three-dimensional sense, the works draw out parallels between the intent and expression of each artist, regardless of medium or craft. “I think that he decided to create images that would uplift his viewers and supporters in a way that would make them feel empowered about being who they are and what they represent,” says Adams. “I think my work is really more a celebration of blackness in the most contemporary sense, in a way that’s really unapologetic.” In this sense Kelly’s journey indeed continues.